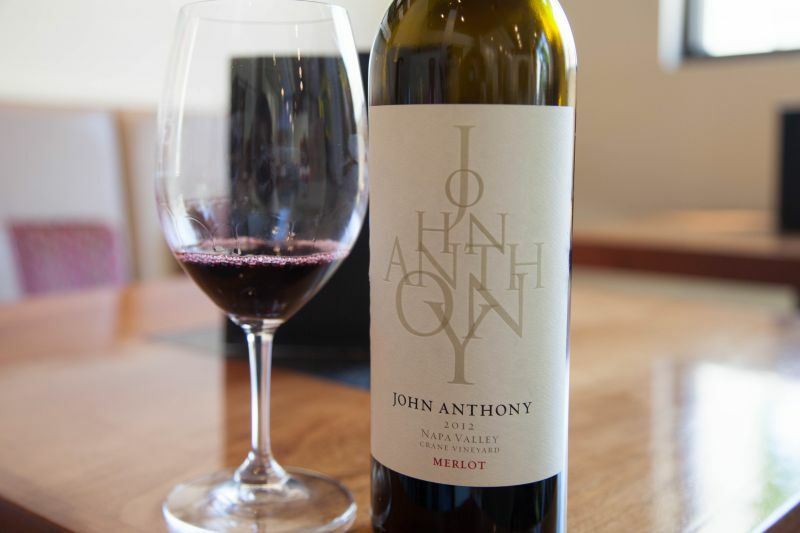 On a recent trip to Napa California Girl, a friend from Chicago, and I dropped into John Anthony tasting room. It is on First Street, part of the building that houses the Andaz Hotel. 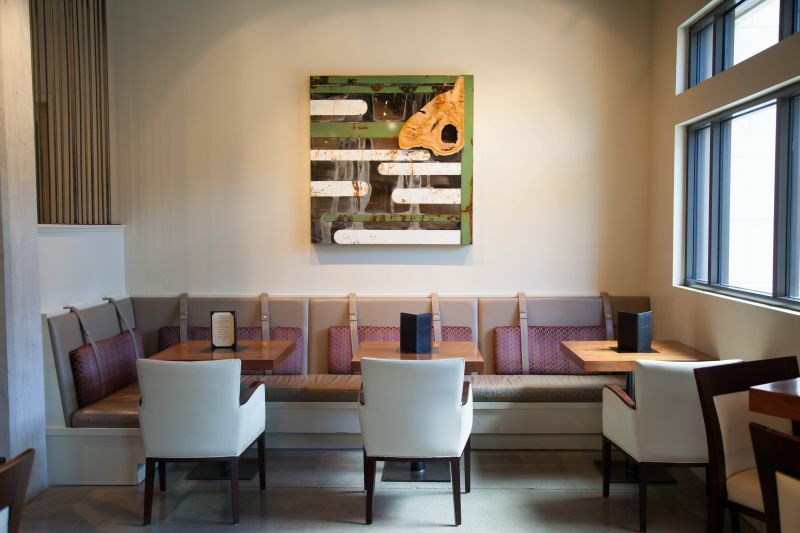 The interior was strikingly modern, with a wide array of seating options. There were stools at the bar, more stools at high tables, and lower tables with sofas and chairs. We selected the last of these for our tasting. California Girl comments: Although we didn’t have an appointment and just wandered in, the staff really tried to be nice and accommodate us. They were short staffed, but really made every effort to give us a great experience. That says a lot for them. Having gone here on a whim, it was only as I was doing some research for this article that I found that the owner’s name is John Anthony Truchard. He is the son of Tony Truchard, founder of Truchard, about whom we blogged a few weeks ago. California Girl comments: The tasting room was very designer chic. 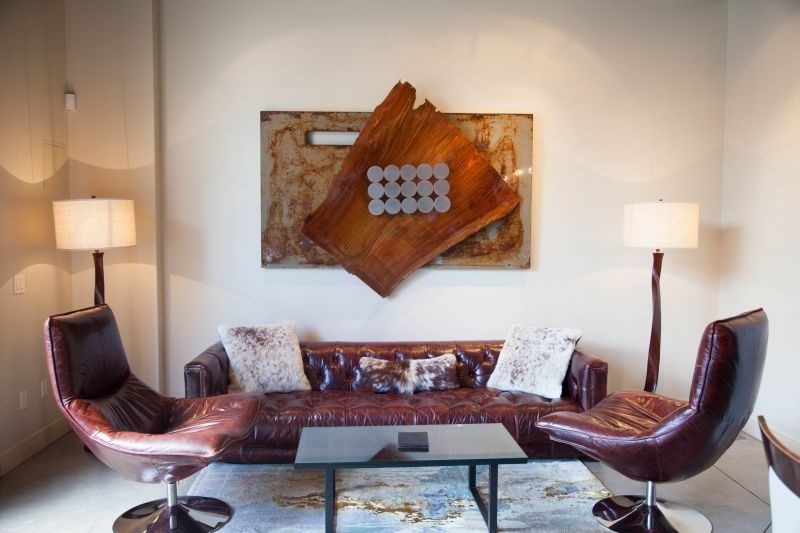 It is interesting to look at, and quite striking, but not somewhere that is comfortable to linger. They have straps on the back of the seats that stick into your back, and furnishings that are low to the ground. 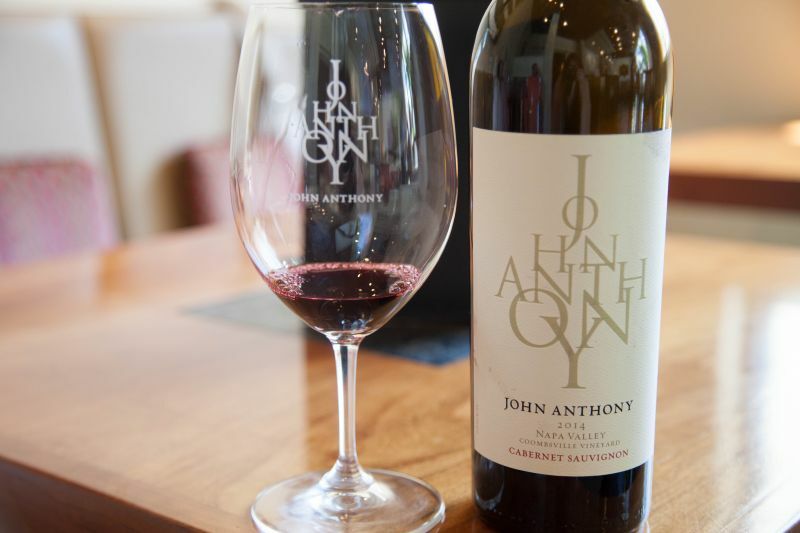 Unusually for a winemaker with a downtown tasting room, John Anthony makes wines from grapes he has grown on land that he manages, rather than buying grapes from growers. 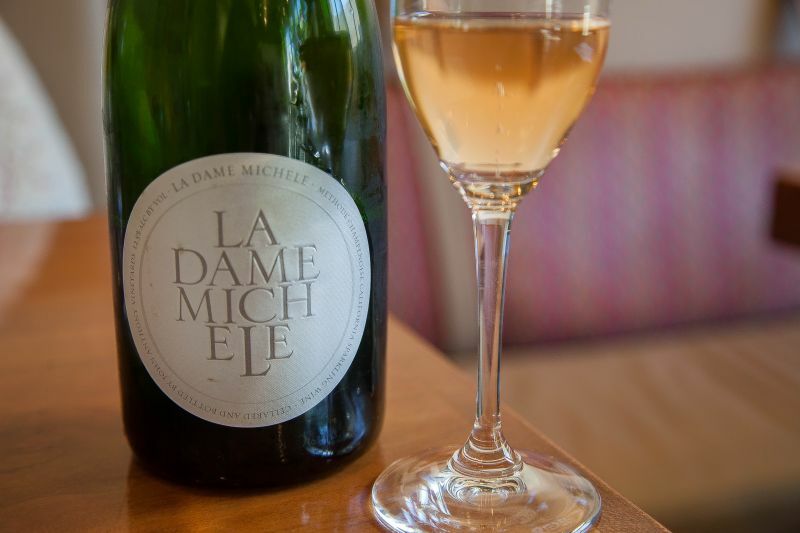 The first taste was a sparkling wine: La Dame Michele Blanc De Noirs ($55). The nose was floral with strong aromas of yeast. Dry, with an assertive acidity and a definite metallic taste. There was but the barest hint of peach. I think the wine was unremarkable and that is a kinder description than either of the other two people would use. Comparing the price to other Napa Valley sparkling wines means that this is a definite pass. California Girl comments: I have to agree, this wasn’t a great sip for my personal taste. The tasting menu allowed us to try three wines from a list of eight items. Given that we were a trio, this enabled us to try all of the wines on offer. I started with the 2016 Napa Valley Carneros Sauvignon Blanc ($25). All too often I find California Sauvignon Blanc to be disappointing, a feeling shared by California Girl. Our friend is a red only person. So I took this as a sacrifice for the blog. Virtue can be its own reward. I was very impressed with this wine. The nose was complex: Mint, passion-fruit, and sweat. The wine was crisp without being a one-dimensional offering of acidity. The flavours were of apple and a finish of kumquat. The price of $25 makes this an ideal summer sipping drink. My second glass was of the 2016 Church Vineyard Sauvignon Blanc. At $55, this is a wine notably more pricey than the previous Sauvignon Blanc. The first impression, from taking in the aromas was positive: apple, passion fruit, canned tuna, and spam. In the glass, the wine showed a rich golden shade in contrast to the paleness of the previous wine; no doubt reflecting the aging in oak that this wine had received. It was in the mouth that this wine disappointed, with an acidity that felt out of balance and the fruit notes limited to grapefruit. It is not a bad Sauvignon Blanc, but I definitely preferred the first one. The last of the whites was the 2015 Chardonnay ($65). The nose was a captivating mixture of vanilla, apple, and toast. The wine was surprisingly pale in colour given, that as the nose implied, this had been fermented in oak. The wine has a buttery mouth feel, backed by a dazzling acidity which in turn was balanced by rich flavours of pear. I liked this Chardonnay, but the Truchard Chardonnay makes better use of acidity and is significantly cheaper to boot. California Girl comments: This wine really let me down. The nose was all there and my mind and taste buds were ready for a treat, but when tasting it, it just didn’t reach its potential. 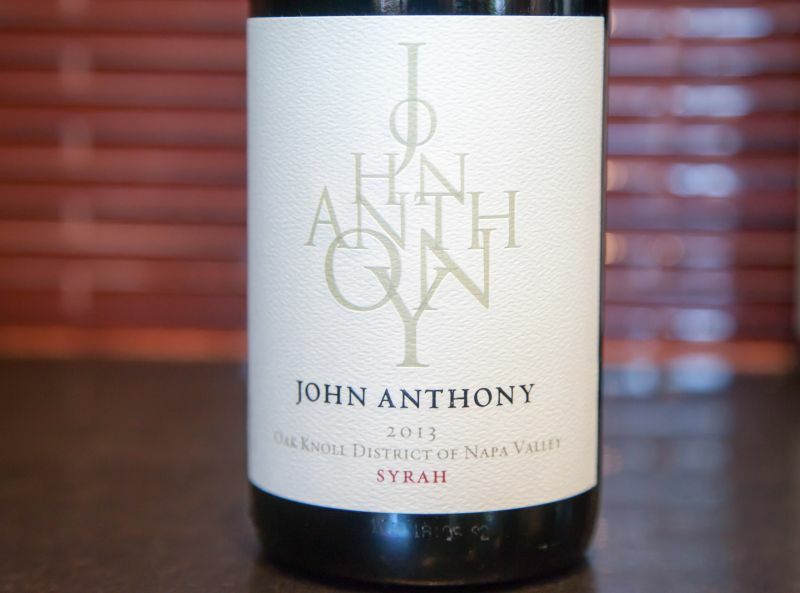 The 2013 Oak Knoll Syrah ($70) was the first red. The nose was a mix of blackcurrant cordial and wood. The flavours were a blend of blackberry, root beer, and tea. Michelle Truchard, the winemaker’s wife describes it as having bracing tannins; which reflects the wine’s approach. I think it may improve with age, but now it feels out of balance. The Crane Vineyard Merlot at $70 a bottle was our next stop. The nose was blackcurrant infused with strong herbal notes. An aroma that promised much was supported by rich raspberry and rosemary flavours. The finish lingered long and pleasantly. This was my favourite of the red wines we tried. California Girl comments: I would have to agree. I liked this wine. It had wonderful mouthfeel, and I liked the complexity of the sip. If I were to recommend one of their wines, it would be their merlot. 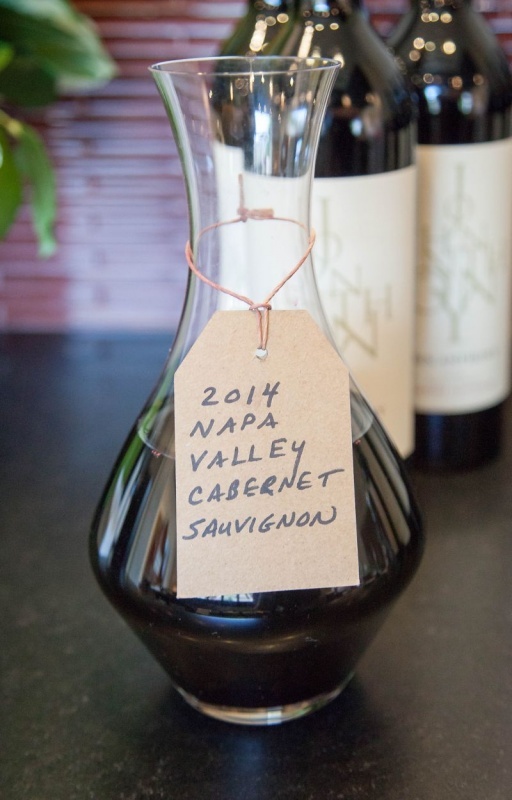 The 2014 Napa Valley Cabernet Sauvignon ($75) had aromas of candy and cardamom. The color was an intense dark purple that was as close to black as you are likely to find in a red wine. Taking a sip I was immediately aware of the tannins, which near overwhelmed the raspberry and spiced plums. There is promise in the wine, but it is not yet ready to drink. This in stark contrast to many Napa Cabs of this vintage, which while they will improve with age, are enjoyable now. I note that the winery suggests drinking in twelve to fifteen years. California Girl comments: I think this wine will be really delicious in 5 years time. If you can buy it and hold on to it, you will have a great sip. It will mellow and all of the beautiful flavors in it will shine. Obviously, if you can hold on to it for 10 years or so, it will be really lovely. The last two reds had been decanted before serving. This seems like an excellent idea, but not one that I have often seen practiced at other wineries. The wines served in this manner were the Oakville Cabernet Sauvignon ($105) and the Coombsville Cabernet Sauvignon ($135). The first of these had a nose of plum, raspberry, and alcohol vapour. The tannins were assertive, but integrated into a wine that tantalized with fruit, but left a finish heavy in pepper. The John Anthony Commbsville Cab is dry-farmed. It had a nose on which I detected pepper and our friend said the aromas reminded her of sunshine. The taste was complex with black cherry and pepper to the fore, but with an underlying raspberry sweetness. This was a wine with promise, but a price tag to match. 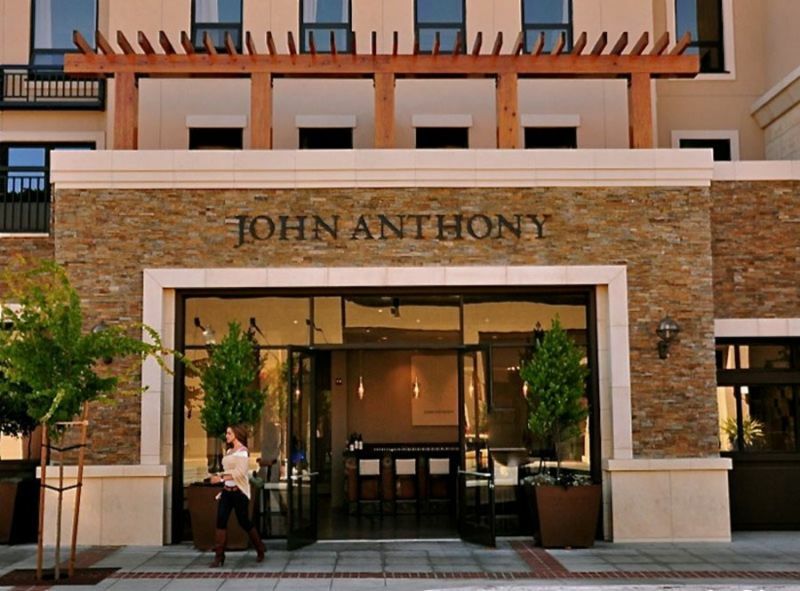 Overall, I was a little disappointed with the John Anthony Tasting experience. Given the prices, I wanted to have wines that were impressive, but apart from that first Sauvignon Blanc, none seemed special. The ambiance of the room was appealing and the service was good, but not remarkable. One final thing that annoyed me was the charge. The price we were quoted as $25, a normal fee for tasting, but when it came to settle, both tax and service were added, bringing the total to $32.33. I have not seen either charge added in other wineries. sad, you were disappointed. Sometimes the wine is good but the prices make them fall into a different category. You subconsciously are expecting something when you see a certain price tag. 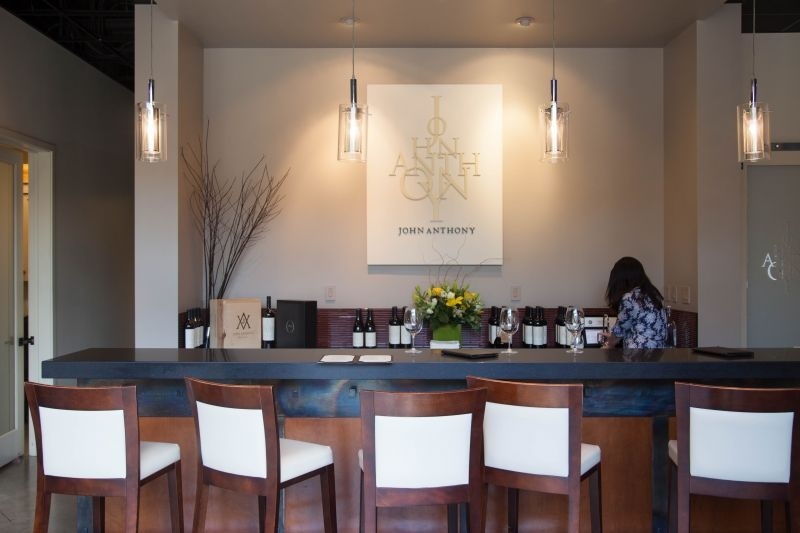 the tasting room looks very chic. Too bad its not comfortable.